The lawyers of Ontario have a tradition of military service dating back to the early days of settlement. When the War of 1812 began, military service was compulsory for adult men in Upper Canada and so virtually all members of the legal profession served in the militia. During the Rebellion of Upper Canada in 1837, the legal profession was sharply divided between those who believed that it was time for radical reform and those who insisted that the status quo be maintained. In 1914, when what was then known as the Great War broke out, the province's lawyers immediately began to answer their nation's call. One hundred and thirteen lawyers and students-at-law gave their lives during the First World War. 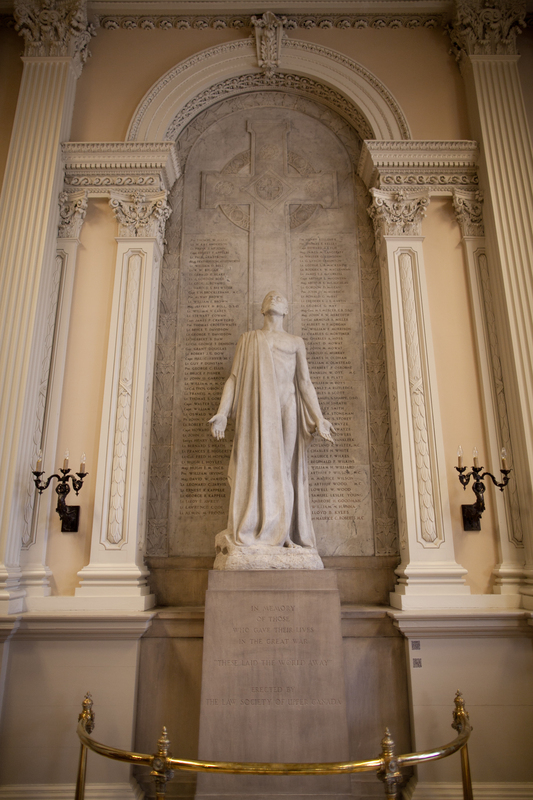 In their honour, a memorial was unveiled in the Great Library in 1928. The proposal to create a lasting record of their contributions to the war effort was first raised in Convocation in 1916, but a decision on the matter was deferred. Bencher Frederick Weir Harcourt raised the idea again in 1922. He suggested that the Treasurer appoint a special committee to review the concept of a war memorial and to report back to Convocation. Although the motion carried, no committee was appointed until 1924, when Harcourt himself became Treasurer. At that time, the committee recommended, "That a Memorial be erected, either stained glass windows or a monument, the cost to be not more than $15,000." Convocation approved the recommendation and notice of the commission was placed in local newspapers. In 1926, Toronto sculptor Frances Loring visited the Great Library, which the Benchers had decided would be the site of the memorial and submitted a letter of tender outlining her proposed design. 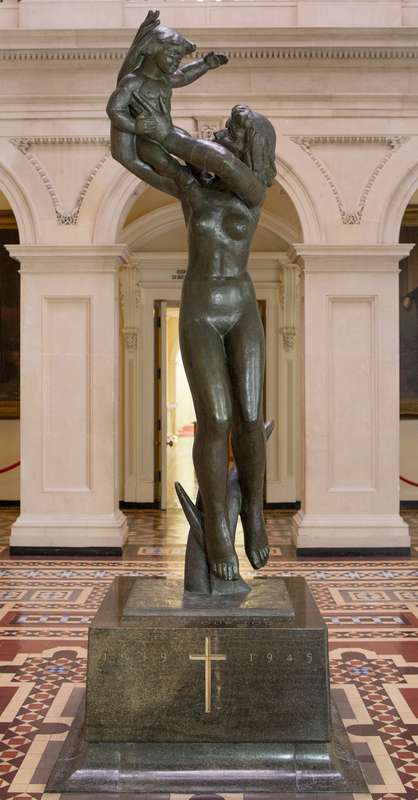 Ms. Loring wrote: "The figure to be sculpted in Italian marble not less than seven feet high, to be in full round, isolated from the marble panel at the back, standing on a base of Bedford Stone about the same height as the wainscoting in the room." Convocation authorized the committee to enter into a contract with Ms. Loring and to pay her $10,000 for her work. The contract was signed in 1926 with a promised completion date in 1928. When the memorial was unveiled it depicted a naturalistic draped figure in white Carrara marble. Behind the figure were the names of those members of the profession who had lost their lives. Despite the Society's best efforts to compile a complete and accurate listing of names, shortly after the unveiling it was discovered that one of the members listed, H.C. Draper, a Toronto lawyer, was in fact very much alive. The Society acted quickly to rectify this embarrassing error; Mr. Draper's name was chiselled out and replaced with that of Captain Hal C. Fryer, whose name had been missed. The only remaining evidence of the error is that Captain Fryer's name is out of alphabetical sequence. In the ensuing years, the Society was notified of other members whose names had been left off the memorial and they, too, were added at the bottom of the inscribed tablet. In 1939, with the outbreak of the Second World War, members of the legal profession rushed once more to serve their country by enlisting for active service. In total, almost one thousand Ontario lawyers and students-at-law saw active service before the conclusion of the war. Fifty of those selfless soldiers paid the ultimate price. Although the number of deaths among members of the profession was significantly smaller than it had been during the First World War, the sense of loss felt by the legal community was no less acute. In 1946, the Law Society established a War Memorial Committee to recommend ways in which to honour those members who had lost their lives during the Second World War. The committee, chaired by W.J. Beaton, asked Colonel Ferdinand Marani, a Toronto architect, to study the matter. Colonel Marani suggested that a memorial be placed in the lower Rotunda of Osgoode Hall and that Cleeve Horne, a leading portrait artist and sculptor, be asked to create it. Fearing that the Society would want him to take a traditional approach personifying the sorrow and sadness of the war, Horne declined the commission. Earl Smith, the Society's Secretary at that time, won Horne over with his suggestion that he use the words of the poem "For Your To-Morrow We Gave Our To-Day" as his inspiration for the memorial. Inspired by the suggestion, Horne reversed his decision and accepted the commission. His final concept was that of a woman looking upward to a baby held in her up-stretched arm. The sculpture, Horne felt, symbolized hope for the future through the sacrifice of those who fell. When the preliminary model was ready for viewing, Secretary Smith became quite concerned that the statue of a naked woman might offend the Treasurer, Gershom Mason, who was a staid and stern man. Attempting to avert disaster, Smith took various small groups of Benchers to view the model. He purposely left Treasurer Mason's visit until the end by which time all the other Benchers had expressed their approval. To Smith's surprise and delight, however, the Treasurer was quite taken with the model and instructed that construction of the memorial should begin as soon as possible. On October 16, 1951, Major John Foote, who had been decorated with the Victoria Cross and was at the time the provincial Minister of Reform Institutions, unveiled the war memorial. In October 1956, Mr. Justice Colin Gibson, a much decorated war veteran, wrote to Treasurer Cyril Carson pointing out that although the Law Society had erected memorials honouring those who gave their lives during the First and Second World Wars there was no formal service held in their memory. He proposed that the Law Society establish an annual ceremony to be attended by Benchers, members of the judiciary and the profession. Convocation agreed and approved the creation of a small committee, assisted by the Treasurer and two judges, to plan a ceremony. The first Remembrance Day Service at Osgoode Hall was held on Friday, November 9, 1956. It was a simple yet dignified ceremony, a fitting tribute to those who sacrificed so much to ensure our freedom. From the early days of settlement, members of the province's legal community have, in times of unrest, served their country in military service. They have done so selflessly and without hesitation. Many paid for their patriotism with their lives. We can only imagine the contributions they would have made to our profession had their lives not been cut short. "November Tribute Planned for Military Veterans," Ontario Lawyers Gazette 2,3 (May/June 1998). Minutes of Convocation, 1924, Law Society of Upper Canada Archives (Virtual Exhibit). Rebecca Sisler, The Girls (Toronto: Clarke Irwin, 1972), 42; C. Boyanoski, Loring and Wyle: Sculptor's Legacy (Toronto: Art Gallery of Ontario, 1987), 35.